2 bedrooms, 1 bathroom, sleeps 6 with Free WIFI. This is a 2 bedroom 1 bathroom apartment with a double pull out sofa which will sleep 6. Fully furnished to a high modern finish. All the windows have mosquito nets which is great for sleeping at night with the windows open. We have all the mod cons, all you need to bring is yourselves. The apartment is on the 1st floor and has 2 terraces, 1 off the kitchen/living room with an awning, perfect for breakfast and the other on the roof the full size of the apartment with a pergola shaded area with seating area for when it gets too hot. We get the sun all day if you want with the choice of the 2 terraces. 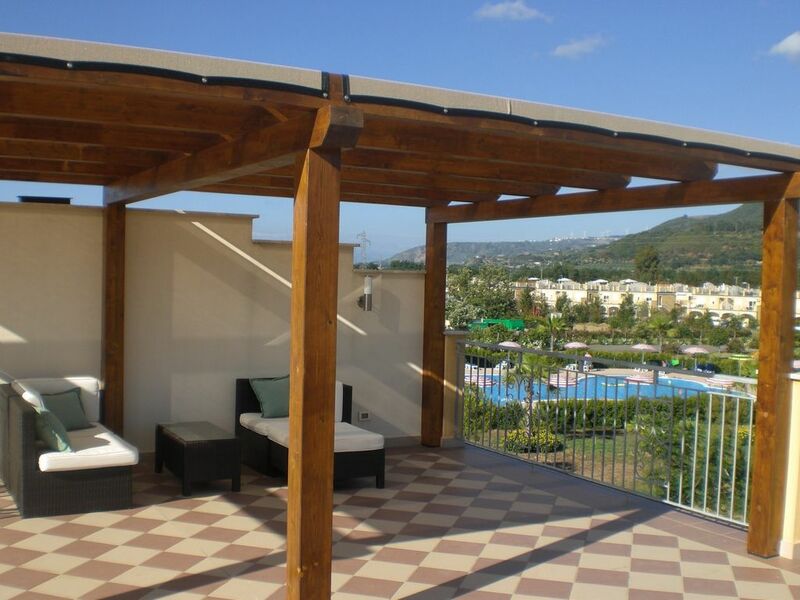 There are also 2 sun loungers for sunbathing with a view over 1 of the swimming pools. We have air conditioning in the the living/kitchen area and the master bedroom as well as a fan in the 2nd bedroom. The property is on the beach side of the development and is a short walk to the beach as well as 1 of the swimming pools ( which you can see from the bedroom window). Our apartment has it's own private WIFI for a better signal. 2 Terraces. 1 The full size of the apartment on the roof. 2 Tennis Courts Free for guests. Our apartment is a short walk to the beach and only 50 metres to the nearest swimming pool. The resort has 2 large outdoor swimming pools, 2 tennis courts and a 3g soccer pitch. There is also a fully equipped gym and restaurant on-site. There is security on-site to keep the resort private and entry is by swipe card only. We found our stay at the Pizzo Beech Club completely relaxing. The property was a good base, had everything we needed and was clean and tidy. If I'm honest, as a family of four with two teenagers, a bit more living space inside would have been nice, but the roof terrace provided a great additional space and we spent most of our family time there. A big plus was the property's private wifi as the resort wifi wasn't very good. Just a shame it didn't reach the roof terrace. Pizzo Beech Club itself was incredibly relaxing and felt very safe with the gated access. again it is clean and tidy. Lots of space at the two pools and never struggled to get a sunbed. Also lovely to have the private beech space just a short walk away. The complex staff were very helpful, especially Rachel (English speaking) on reception. The complex is sandwiched between two other resorts. At night their music could be heard from the roof terrace, but it provided us some entertainment as well. Once inside with the A/C on it couldn't be heard. The family enjoyed a very relaxing holiday. Thanks for your kind words Victoria we love it too. The kids loved the two pools, especially the slide. There is a small restaurant on site serving pizza at teatime, amongst other pastas and fish type dishes. There's not a huge menu but it's not badly priced. The apartment is well equipped and maintained. Everything was very clean. There was one annoyance only - a squeak on the water system. There is a great roof terrace and BBQ. We enjoyed the apartment but it was a little quiet in the evenings for our kids. There was no entertainment at all which I should have checked out a bit more. But it meant we had to talk to each other which was actually really great! We wouldn't go back as a family, but if my husband and I could go on our own (with a car), this place is ideal. We always recommend that our guests hire a car as there is so much to explore. pizzo beach club is about 15-20 minutes drive from lamezia airport heading towards SS18. easy to find. the apartment was clean, air con (lounge and master bedroom) on the first floor with a lovely terrace to enjoy the views. we had most of our breakfast upstairs and evening drinks there. great spot to relax. we have enjoyed the apartment and was clean and immaculate, there was umbrellas and some kids toys, tennis rackets for the kids to play with and all provided. was a hit with the kids. beds were comfortable, well equipped kitchen, there is also a washing machine available. satellite tv with various channels but to be fair we did not use it much so can't give more details. also private WIFI which was handy. the resort I would say is a 3/4 stars not 5 stars as advertised. there is two pools near by and main one with slides which was a hit with our kids but slides only open from 11-12 and 1600-1800 daily. there is one small shop by the main pool where you can by beer, wine, ice creams etc...and main restaurant opens from 12-1400 lunch and 1900-2200 dinner. did not eat there so cant comment, fairly reasonable but not as cheap as pizzo town or surrounding areas. Car is essential for this destination which was clear from the beginning. great part of southern Italy and we enjoyed it very much. We will be returning next year for longer this time. One things to bare in mind, pizzo beach club is near an all inclusive butlins style resort where the music from the entertainment is very loud, it starts from 11AM-3PM AND then the worst is between 2000-midnight where the singing can be overwhelming, personally did not bother me, got used to it but drove my wife mad. the singer could not hit a note..... when you are in the terrace you could hear it very loud and clear. it is particularly bad in JULY-to mid September. Apart from this minor issue, the whole experience was great and would recommend staying here. Mr Keenan was informative and great to deal with. thank you. Heel leuk appartement met een geweldig dakterras. Mooi vakantiepark en Pizzo is een leuk plaatsje. Everything was exactly how we'd expected and what we'd seen in the pictues. The apartment with the roof terrace is fantastic. There is everything you need for a peaceful, relaxing holiday including beach towels and free sun loungers on the beach. The pool was clean and almost empty all the time and the sea was clear and warm, too. The owner is kind and his representative Tom was at hand if we needed anything. Pizzo is on a hill top and is one of the most beautiful towns on the west coast. This is the northern stretch of the celebrated Coast of the Gods and has some of the best coastal landscapes in Italy with uninterrupted views of the crystal clear water of the Mediterranean and Ionian Seas and long sandy beaches. Pizzo is famous for it's ice cream Tartufo which is one of the best in the world. The area is steeped in history and culture and has something for everyone. If you want to get away from the property there are lots of shops,daily markets,restaurants and things to see. The locals are very friendly and are big into family and enjoying the simple things in life. Of course you may not want to leave this resort as we have all you need on site. Golf: 9 hole golf course 40 kilometres away. Ski: Skiing is 110 kilometres away. 25% deposit required at time of booking. Balance due 30 days before arrival. Security deposit of 200 against damage before travel and will be returned within 2 weeks after check out. 35 surcharge per week for use of air conditioning also. Check in time is 4pm on. Check out time is 10am.